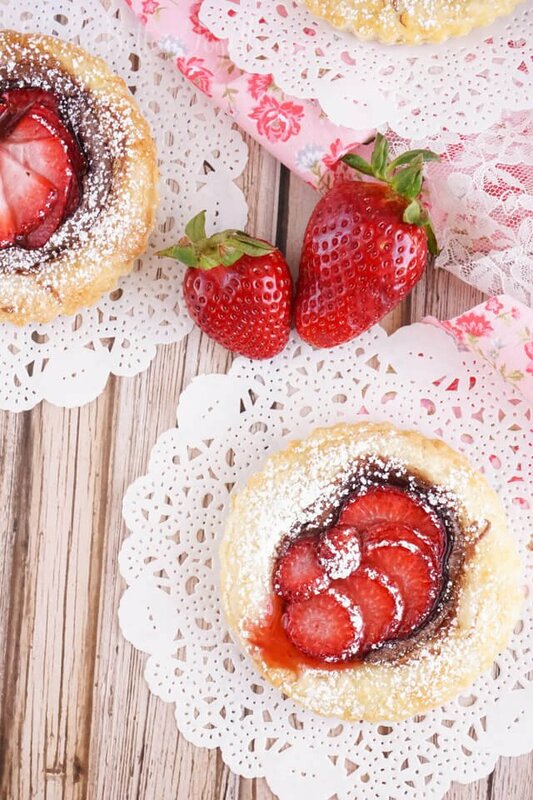 These Strawberry Nutella Tarts inspired by The Selection Series are so simple to make. 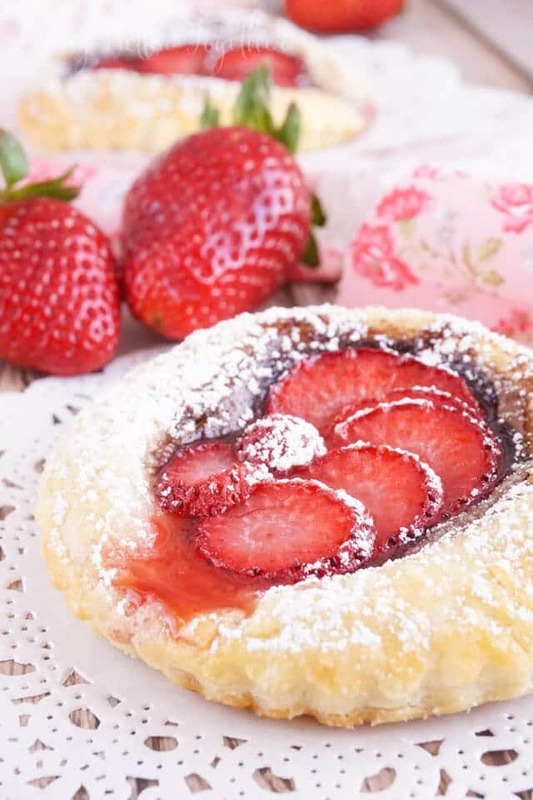 Rich and creamy Nutella and tart strawberries in a flaky pastry dusted in sugar – they’re absolutely divine! I’m 25 and I still believe in fairy tales. When I was a kid my mom got me these two giant books with gold lined pages filled with beautiful stories of heroes, princesses, and dragons. I devoured those books. Somewhere over the last 10 years, fairy tales haven’t seem to have had as large of a presence in my life. Is it our society as a whole that has suddenly steered away from happy endings or is it just because I’ve gotten older? Either way, it’s a problem, and one that Kiera Cass has solved. 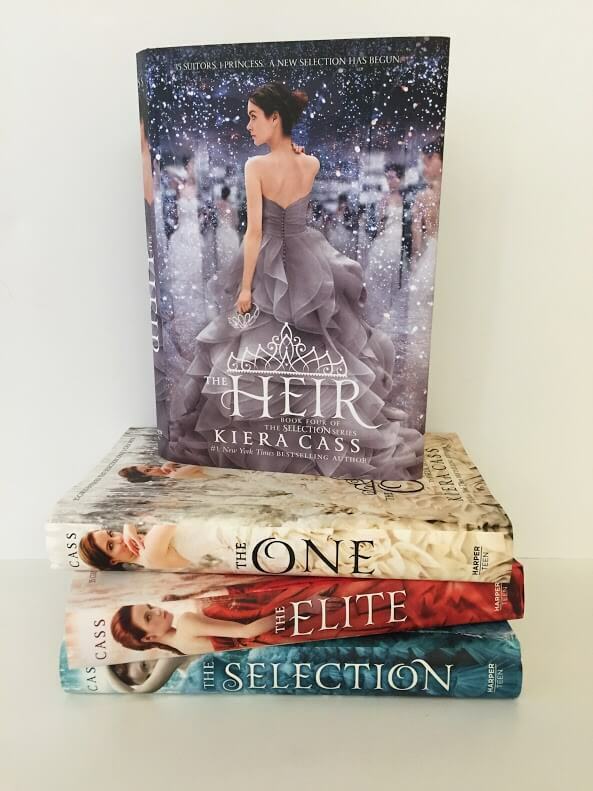 I was excited to receive and dive into The Selection Series, a modern day fairy tale that will have you glued to the pages until you finish all three books in as many days! <— like I did! Binge reading for the WIN! I’ve had this book on my to read list for months, maybe even a year. I was intrigued by the reviews that described it as Cinderella meets Hunger Games. A lot of reviews referred to this series as dystopian, but it really isn’t. It really isn’t at all how I thought it would be, but I still loved it! It’s got action, love, and a great cast of characters; everything a great series needs. I instantly fell in love with America, I really enjoyed her smart, kind, and defiant personality. I liked both Maxon and Aspen’s characters, but of course they had their flaws, then again, don’t most teenage boys? I thought the premise behind the books was serious enough for an adult, but not so dark that preteen couldn’t read it. It’s the perfect book to take with you to the beach or cuddle up on a rainy Sunday with. Okay, so here’s the thing, The Selection ends with a bit of a cliffhanger, so be prepared and have The Elite on hand so you can jump right from one to the other. Oh, and then you better have The One too because you’ll just have to find out how it ends. Then, much to my excitement, The Heir will be released on May 5th and you can bet I won’t be wasting any time to start it. In fact, it’s going with me on the plane to Scotland! Think I can cruise through it in 6 hours and 55 minutes? I bet I can! Plus, look at that cover! Totally Gorg! 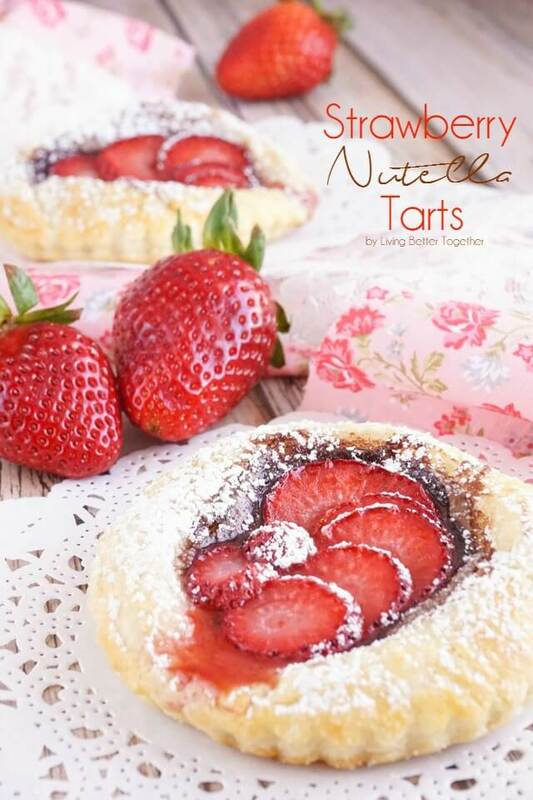 But when you curl up with the book, make sure to bring a batch of America’s Strawberry Nutella Tarts with you! These were inspired by one of my favorite scenes from the book. During the first breakfast America has in the palace, she has a strawberry tart that’s the most amazing thing she’s ever tasted. 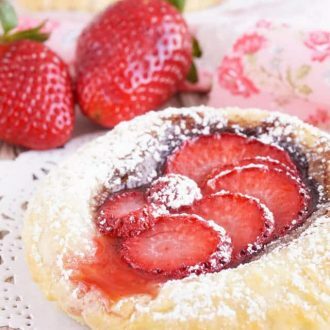 Her sounds of delight catch Prince Maxon’s attention and she tells him that the tarts are so good they’d make her sister, May, cry happy tears. He wagers a bet with her that May won’t cry. If she does, America gets to wear jeans and if she doesn’t, Maxon gets to take America on a date. You’ll have to read the book to find who wins! America talks about how flaky thee tarts were, so I instantly thought of puff pastry, does it get any flakier than that? Obviously, tarts made in the palace would be a bit more over the top than anything she would have had on the outside. I thought the addition of Nutella sounded like just the thing to add a little richness. Boy, was I right! I almost cried over how good these tarts when I first tasted them. They were straight from the oven and the flavors just married so perfectly! These tarts are best served fresh from the oven and are perfect for breakfast or dessert. If you want a little extra indulgence, add a scoop of vanilla ice cream! Unwrap pastry dough and unfold onto a different floured sheet of parchment paper. Use a rolling pin to gently smooth out the creases in the dough. Cut pastry dough using a 4 inch round cookie cutter or cut each pastry sheet into square quarters. In a small bowl, lightly beat together egg and water to create an egg wash and brush along the edges of the cut pastry dough. Pop the Nutella in the microwave for 15 seconds to make it easier to spread, then spread about 1 tbsp of Nutella in the middle of each pastry, leaving about an inch wide border. I find using the back of a spoon and working in a circular motion works best. 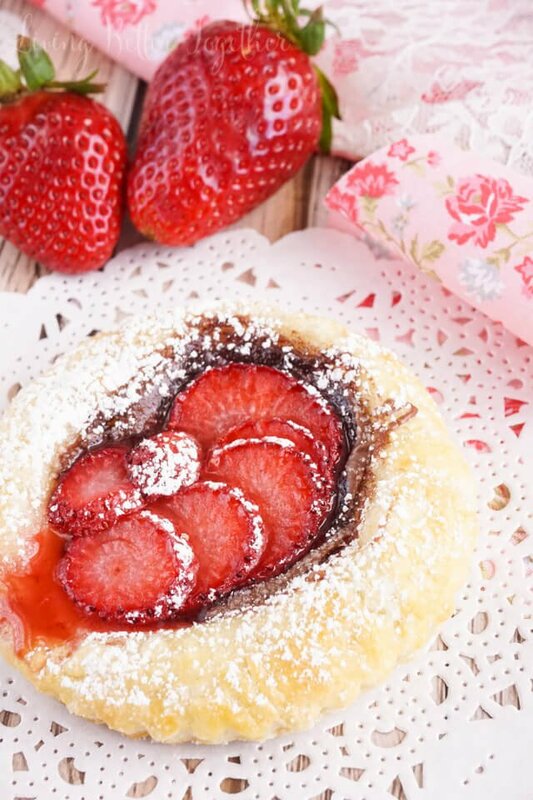 Slice strawberries into thin slices, arranging one strawberry on the Nutella of each tart. 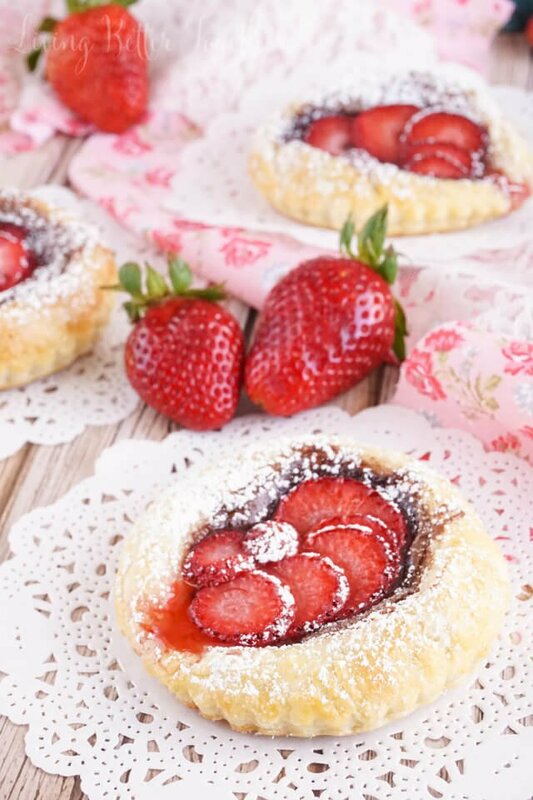 Lightly sprinkle tarts with granulated sugar. Bake for 12-14 minutes until edges of tarts are golden brown. Remove from oven and transfer the parchment paper and pastries to a wire rack to cool for 5-10 minutes. Dust with confectioners' sugar and enjoy warm. Best served fresh and warm. Add a scoop of ice cream for dessert! Check out more Food and Fiction posts and find something fun to read after you’re done with The Selection from my Summer Reading List. 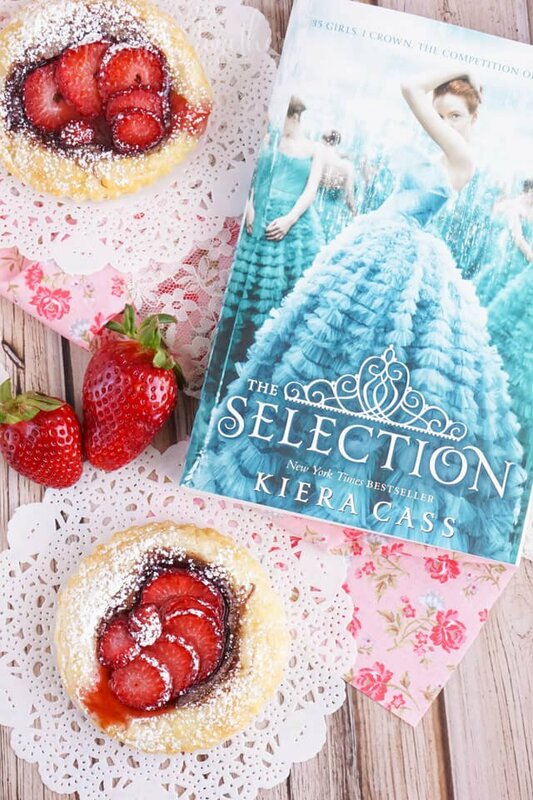 A good book and a delicious dessert, yes please! This looks so good and I want to change out the book series too! Thank you, Catherine! I think she would too! Love this simple recipe, simple can often be the tastiest! Looks fabulous! 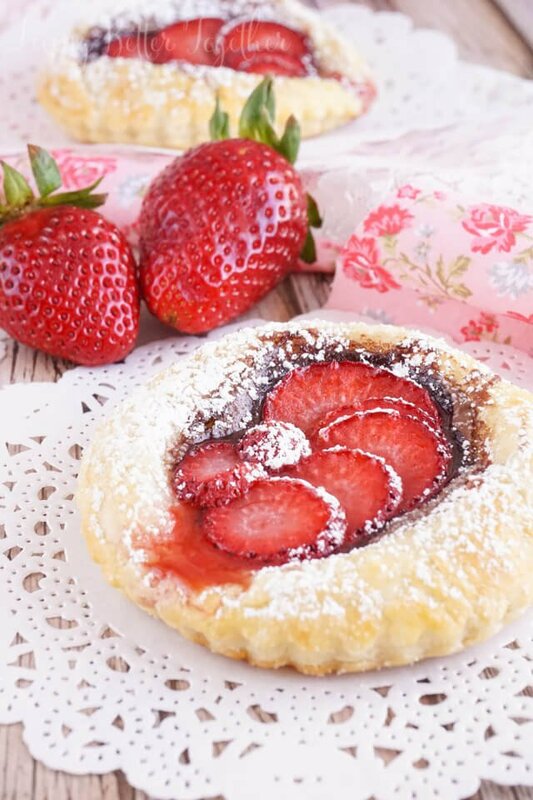 These tarts are so beautiful! Love the dusting of icing sugar, it’s so striking! Those look so good! I think I’ll pick up the book too, I need a fun series! You had me at Nutella! These look good to snack on while curling up with a good book! I am loving everything about these tarts! So easy, beautiful and sounds delicious!! So simple and man does that look delicious…!